As we approach Remembrance Day and the anniversary of the end of World War 1 — the 11th hour of the 11th day of the 11th month — it is appropriate to reflect on a chapter of Australian history that seems to have slipped through the cobblestones of contemporary school curricula. It concerns Australia’s first naval battle and its aftermath. The departure of the first ANZAC force to the Middle East on the November 1, 1914, had witnessed Australasian troops assemble in Albany, Western Australia, where they were joined for the first time by their New Zealand comrades. As the convoy steamed westward, it travelled close to the Cocos Islands, a number of coral atolls strung around a central lagoon in the middle of the Indian Ocean, roughly level with Darwin in latitude and below Singapore in longitude. For many years a cable station, manned by civilians, had been located on Direction Island, one of the Cocos group, where it was a vital link in the only direct communication chain connecting Australia with Britain and Europe. The main cable remains in place and can still be seen today, snaking ashore from the depths of the Indian Ocean. The Emden had been sinking allied shipping in the Indian Ocean since the start of the war and, early on November 9, the Cocos Islands cable station radioed a message "SOS Emden here" that was picked up by the convoy. 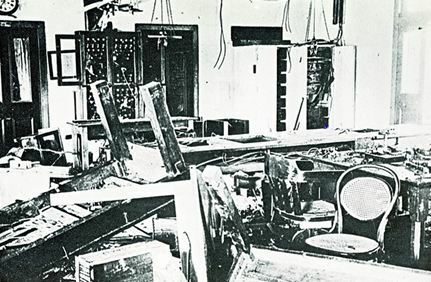 Knowing the Emden’s crew would be monitoring local radio transmissions, the Sydney’s radio operator cannily responded with an acknowledgement, but intentionally reduced his transmission to quarter strength. The Sydney’s acknowledgement was indeed picked up by the Emden and interpreted, as intended, by the raider’s radio operator as indicating the Sydney was still 200 miles away, whereas the distance was only 50 miles. Electronic warfare, primitive though it was, was part of the World War I combatants’ arsenals from the very start of the conflict. The Emden’s Captain Karl Friedrich von Muller launched a raiding party under the command of Kapitan-Lieutenant Helmuth von Mucke, who attacked the cable station and blew up the radio tower while taking care, as requested, not to have the mast fall on the island’s tennis court! The raiders also cut what they took to be the cable into 18-inch lengths. Unfortunately for the Germans their souveneirs were worthless, as they had fallen for a decoy. While they did a thorough job of smashing the cable station (below), the main cable remained buried and unnoticed in the sand beneath their feet. Suddenly, HMAS Sydney broke the horizon and the landing party was urgently recalled with blasts on the Emden’s siren. Before the raiding party could get back to the Emden, however, the Sydney began firing and von Muller steamed away, leaving the landing party stranded. Although struck by the Emden’s shells early in the engagement, Sydney hauled off and, in a running battle, disabled the Emden to such an extent that Captain von Muller ordered his ship run aground on North Keeling Island. What is left of the Emden is still there today, although it has slid down the reef and is now underwater. Designated as a war grave, a few divers have obtained permission to inspect her at close quarters. I remember seeing her outline and two propeller shafts, still visible from the surface, when stationed on Cocos Islands in the early 1990s. There also used to be an iron boiler on the beach, although the Japanese, in their search for re-usable metal between the wars, landed a party of their own and cut up most of the relic for scrap. 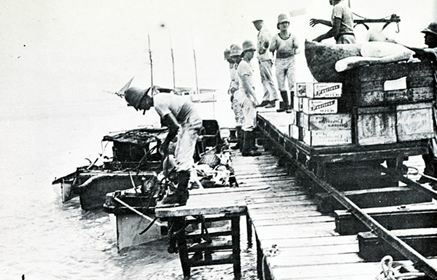 The German sailors left stranded on Direction Island commandeered the work boat Ayesha, loaded with half the island’s supplies (below), and sailed her to the neutral Dutch East Indies, where they took a transport across the Indian Ocean to the Middle East, finally making contact with German advisors attached to Turkish forces. They re-entered the war as heroes and Von Mucke later wrote a book in which the account of his adventures was somewhat diminished by the admission that he had been duped by that decoy cable. The majority of the Emden crew on North Keeling Island were picked up by the Sydney, although some refused to surrender and hid on the island. Some time later, Cocos Islanders visited North Keeling and found their remains on the waterless plot. One sailor’s body was found in a tree, pipe still in his mouth, where he had perished gazing out to sea for the rescue that never came. While the action was taking place, the ANZAC convoy continued steaming to Colombo (then the capital Ceylon, now Sri Lanka). HMAS Sydney, having won the battle, collected the German wounded and steamed off after the convoy. The prisoners, including the wounded, were transferred to a transport and the convoy continued onto Colombo harbour. Now comes the part of the story that, as an Australian, always brings a lump to my throat. Here was Australia’s first victory as a nation and, apart from the attack on the German colonial headquarters at Rabaul, New Guinea, our first recognisable naval victory. As the convoy, together with the ship carrying the German wounded, closed on Colombo harbour, preparations were made for a tumultuous welcome and a victory celebration. Over 7,500 ANZAC troops and many allied sailors lined the ships and docks and made ready to celebrate. The captain of the ship carrying the German prisoners radioed ahead however that any noise or cheering might disturb the German wounded, and this news was disseminated around the ships. According to an eye witness, as the convoy including the damaged HMAS Sydney steamed into the harbour, the thousands of ANZAC troops and Navy sailors, stood to attention and not a sound was heard.